If you're reading The Crafty Pint, there's a better than even chance you've come across breweries releasing a series of beer showcasing hops. For the most part, they use the same base beer then pile on large volumes of a particular hop. 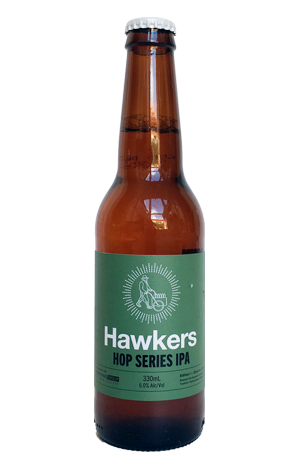 Here, Hawkers does that for the most part but, instead of showcasing one hop in each beer, they're showcasing a region. And first up is Germany. Given most excitement for lovers of hopped up beers tends to derive from varieties coming out of the States, Australia or New Zealand, this may seem an odd choice. Yet, in recent years, hop growers and breeders in the Old World have been busying themselves trying to create aromas and flavours more in tune with the tastes of craft beer drinkers – and that includes Germany. The new arrival that's garnered the most attention is Mandarina Bavaria, so here it's used as the headline hop fronting a trio of less showy backing singers. As the name suggests, it's a hop that imparts sweet, juicy mandarin characters on beers, especially here where the brewers have layered on the hops to an even greater level than their core IPA. Thanks to the older varieties in the mix, it's a little like a Hitchcock movie: there's a sting in the tail. Once you get past the dominant orange citrus and resinous flavours and bitterness, you pick up floral aromas and the lingering herbal, soft spicy flavours you might expect from a pilsner.